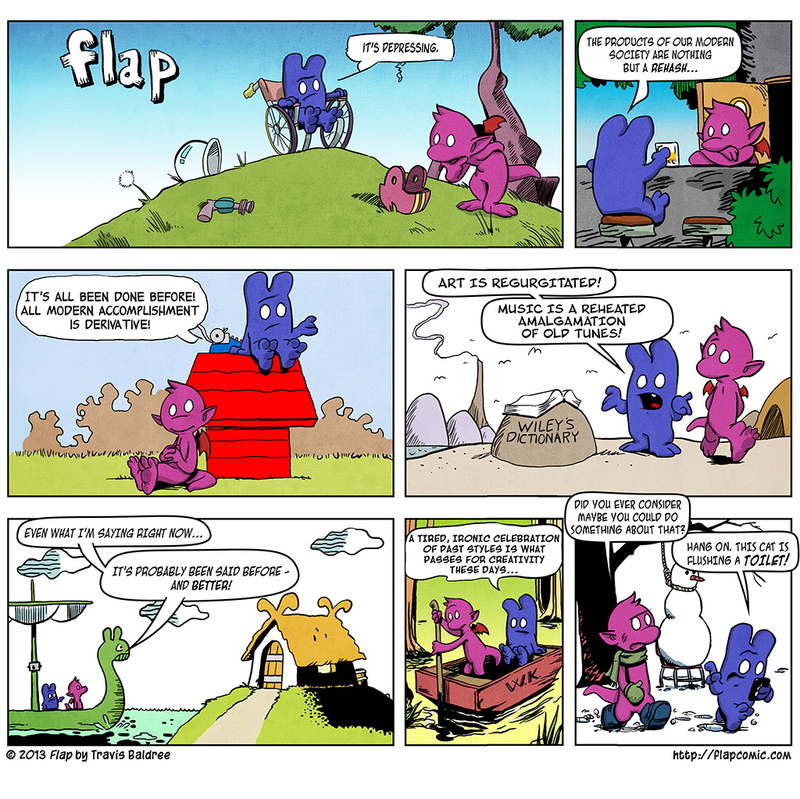 21st strip – that means I’ve managed to stay consistent for three weeks. Cool! With apologies to Breathed, MacNelly, Schulz, Hart, Browne, Kelly, and Watterson. I didn’t actually intend to do this series of nods to other comics. The gag was written separately, but for whatever reason, the idea popped into my head, and I couldn’t shake it. If you were born in the last 15 years, you probably don’t recognize several of these, but that’s OK. I’m sure there will at least be a few people who know all of the references. It was fun replicating the different styles, and picking out elements that I thought were iconic from the strips and incorporating them into the scene, and then dropping my characters in. I did my best to match the character and text bubble styles of each strip as well. It was also very interesting to note strange similarities internal to each strip’s style. For instance, Schulz’s grass is drawn the same way as Calvin’s hair – the little swoopy ‘v’ shapes are the same. Strange. For some reason the inclusion of these artifacts from other strips makes me think more, and gives my mind more to chew on. It’s weird. I think every era thinks it’s all been done. Everyone has talked about the good old days since there were old people. But somehow it’s never the end, and there IS always something new. It just never comes from the quarter you expect. Obviously, a one-off, but I enjoyed doing it. Excellent strip today! Loved the references to older comics of times past. I think that everything is derivative but new things are made by taking something already in existence and transforming it by stretching, bending, and adding to it and molding it further. For example ‘new’ technology is developed by taking our understanding of the physical world and manipulating for our own purposes. Even something derivative is new, it evolved and even though it might look vaguely familiar, it’s still a new thing. We can’t escape derivation – we can’t comprehend things that we’ve never experienced. We might be able to piece together an experience but it’s kind of like a blind man trying to figure out what the color pink looks like. How does one even describe a color in words that actually make the color appear to someone who has never seen any color except maybe black? All I mean by this is that we are the sum of our experiences and we create new things with those experiences, thus everything we create will always be derivative of our senses. But we can create beautiful things with those experiences. One thing I think is interesting is how things become less derivative over time. Their influences recede and become less known, and the thing itself sometimes seems more unique. It’s a very strange effect. Nice one, Travis. Very well executed. And I’m old enough (34) to recognize them all. In addition to all those above, I know you’re a fan of Jeff Smith like me. I was wondering if you were also a fan of Sam Kieth? The writing on the Maxx eventually kind of ate its own tale but the visuals were always gorgeous, IMHO. I always thought Sam’s art style was pretty cool – really organic and kinetic. At the time (mid 90′s!) I was more into the Jim Lee thing, but in retrospect, Sam has the more powerful art. Man..tug those heart strings, why don’t you. I think it’s kinda funny and ironic that you’d post a subject such as this. You yourself are responsible for a game that could very well be accused of ‘recycling’ concepts from other games (Diablo, Fate being just two of the many examples I could give), yet Torchlight II manages to take the familiar and turn it into something completely it’s own. It all comes down to this-there’s nothing new under the sun, everything’s been done that can possibly be done. We’re all recycled bits of code. The universe is endlessly repeating patterns and when you look at the grand cosmic scope of time, it’s all circular. You always end up right back where you started. It’s not about whether or not your thing is the same thing as someone elses thing. It’s about making that thing you’ve taken your own thing, putting your own personality into it, adding your own sensibility and flair. I just want to compliment you on this comic. I really look forward to it. Hope my comments aren’t too out there. This was fantastic. ’nuff said. Glad you guys enjoyed that one. It was a lot of fun to do, and a nice change of pace. Loved the nod to old comic strips. You captured some of my favorites!